Foreign Minister Makhdoom Shah Mahmood Qureshi received the US Secretary of State Michael R. Pompeo today at the Ministry of Foreign Affairs. Welcoming the visiting Secretary of State, the Foreign Minister emphasized that Pakistan looked forward to building sustainable ties with the United States based on mutual trust and respect. During the delegation level talks held at the Foreign Office, Secretary Pompeo was accompanied by Chairman Joint Chiefs of Staff General Joseph Dunford and Under Secretary of State for Political Affairs, David Hale. Foreign Minister Qureshi was assisted by the Foreign Secretary and senior officials of the Ministry of Foreign Affairs. During the discussions, the two sides exchanged views on bilateral and regional issues of mutual interest. The Foreign Minister highlighted that the priority of the new Government was socio-economic development and,for the success of people centered agenda and economic reforms, an enabling regional security environment was imperative. Foreign Minister Qureshi reaffirmed that improving relations with neighbors was a priority. In the context of Afghanistan, the Foreign Minister highlighted thelatest positive developments on the Pakistan Afghanistan front, including operationalization of the Afghanistan Pakistan Action Plan for Peace and Solidarity (APAPPS). He reaffirmed Pakistan’s commitment to continue efforts for promoting peace and stability in Afghanistan. The two sides agreed that present conditions in Afghanistan were conducive to intensifying efforts for a political settlement. They underscored the need for the Taliban to seize the opportunity for talks in response to President Ghani’s offer for an unconditional dialogue. Secretary Pompeo stated that US fully supported the reform agenda of Prime Minister Imran Khan and wished the government success in its implementation. 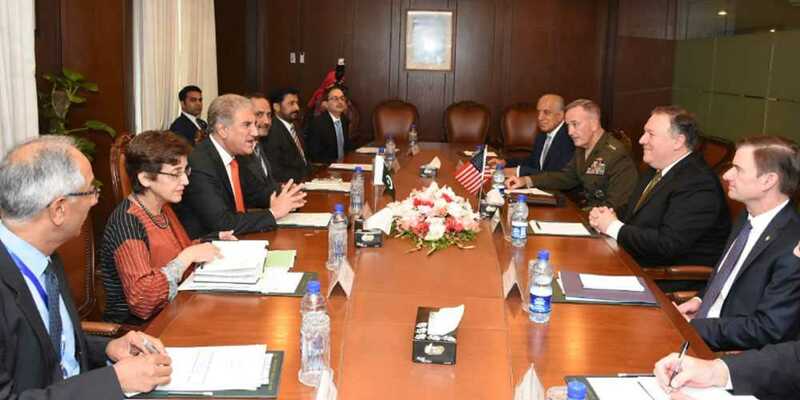 Noting the importance of longstanding Pak-US relationship, Secretary Pompeo conveyed the US desire to work with Pakistan in furthering the shared objectives of peace and stability in Afghanistan. Additionally, Secretary Pompeo and General Dunford paid a courtesy call on the Prime Minister and held a meeting with the Chief of Army Staff.